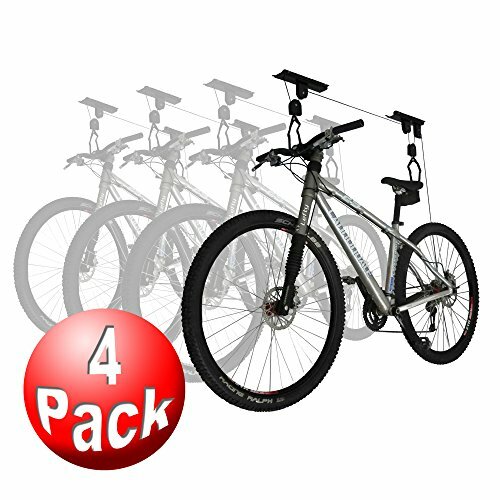 Get a four pack of the top rated / best selling bicycle hoist on the market! There is no such thing as not enough room for another bike. Store your bikes overhead and out of the way. Smooth pulleys and latches make lifting even heavy bikes super easy. The exclusive rope locking mechanism prevents unwanted release and can suspend one bike - 100 lb. load limit. Please note, you can mount this item as pictured or on a 2 x 4 and then onto the ceiling. RAD Cycle Products is an industry leader and backs it up with a warranty which is the best in the business! ►RUBBER COATED HOOKS - Hooks are designed with a protective rubber coating to protect your bike from scratches. ►EASY TO INSTALL - Mount to your ceiling joist or rafter and so easy to use. With only the minimum of tools you can have your bicycle hanging in your garage in no time. INCLUDES (4) RAD Bike Hoists. ►ROBUST ENGINEERING - Allows you to lift heavy products, up to 100lb. Capacity. This is the bicycle hoist that all the other are trying to copy. We don't cut corners. This is the original RAD Bike hoist you've heard about. ►INDOOR USE - For indoor ceilings up to 12 ft. high. Once the bike is out of the way you free up so much floor space you won't know what to do with it all. ►SAFETY LOCKS - Safe locking mechanism prevents accidental release. No one wants to come home and find their bike has fallen to the floor.